Travel to Amsterdam where you will met and transferred to your cruise ship. Transfer to Haarlem. Your Suite Ship is ready for boarding. You may choose to join a guided optional excursion in Haarlem, a major flower-bulb growing district outside of Amsterdam. Explore the former North Sea trading port with its medieval features, gabled houses, and leafy courtyards. You may prefer, instead, a guided optional excursion to beautiful Zaanse Schans, where you’ll see a wonderful collection of well-preserved historic windmills and Dutch houses. Take advantage of the free time left to take a bike ride or a walk through the historic North Sea trading port of Hoorn. Cruise to Enkhuizen and spend the rest of the afternoon walking or biking through Enkhuizen. Later, enjoy onboard live entertainment. Active Excursion: Join your Avalon Adventure Host for a Morning Walk. 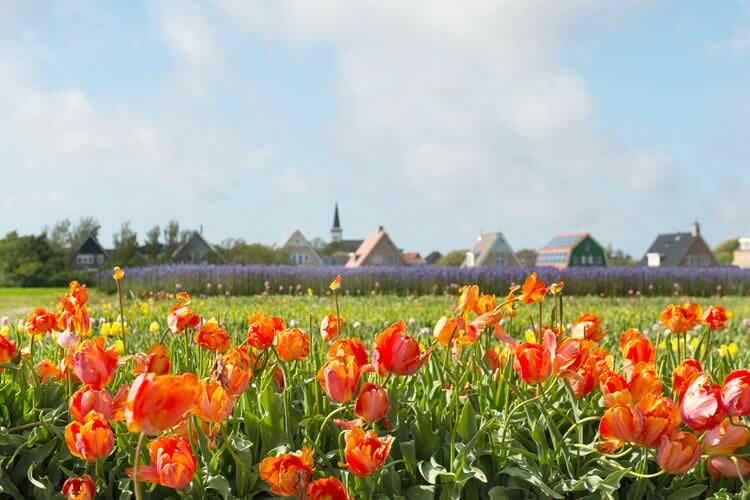 Discovery Excursion: Join a guided tour of local tulip fields and Dutch flower farms. Join your ship in Sneek. There is time for a stroll before dinner. This evening enjoy live entertainment on board. Classic Excursion: Take a guided walking tour of Enkhuizen to get better acquainted with the charm and beauty of this historic harbour village. Discovery Excursion: Join us at the home of a Dutch family for authentic samples of local specialities and conversation, for a true Dutch experience. Enjoy a brief afternoon cruise to Friesland. Discovery Excursion: Take a guided tour of Lelystad’s Batavia Shipyard and board the hand-built replica of the historic Batavia. Enjoy an onboard Cheese Tasting with Genever—the national and traditional liquor of the Netherlands. Discovery Excursion: This morning, attend an Onboard Lecture about Holland and a tasting of the authentic Dutch Deventer Koek Cake. Classic Excursion: Join a guided tour of the Airborne Museum of Hartenstein commemorating the 1944 WWII Battle of Arnhem. Sample artisan beer, a slice of appeltart (Dutch apple pie), or a koffie verkeerd. Take a bike from your ship to explore Rotterdam and the surrounding area. Later, enjoy live entertainment on board. Classic Excursion: Join a full- or half-day guided tour of breathtaking Keukenhof—the world’s largest flower gardens—with more than seven million tulips, daffodils, and hyacinths as well as other bulbs flowering each year. Enjoy an afternoon guided tour of Gouda-famous for its Dutch yellow cheese, stroopwafels (syrup waffles), and Gouda candles. Join an optional excursion on a Culinary Walk through Amsterdam to sample savoury and sweet Dutch specialities. Or choose an optional excursion for a City Biking Tour to discover the countryside. Alternatively take an optional excursion to Holland’s beautiful medieval Muiderslot Castle. Explore Amsterdam’s colourful streets and canal houses, galleries, and shops. Classic Excursion: Take a guided Canal Cruise to explore the iconic waterways of Amsterdam. Float along the Grachten past Amsterdam’s stately homes of the Golden Age. This morning, transfers to the airport for your flight to the UK. All meals on board including full breakfast , buffet lunch and waiter service evening meal. Wine and beer is included with lunch and dinner. Afternoon tea with cakes and sweet treats; midnight snack, choice of premium teas and coffees & soft drinks throughout the day. Terms and conditions apply, all offers are subject to availability and operator booking conditions. All savings are included in the fares shown and were correct at time of print, but are subject to change. Prices are per person based on two passengers sharing the lead in grade stateroom unless otherwise stated. Savings of up to £3,400 per couple are valid on selected 2019 cruises departing in July, August, October, November and must be booked by 30th April 2019. Offer may be changed or withdrawn at any time. †VIP home pick-up service is available if you live within 100 miles of your departure point. If you live further than 100 miles, you can still take advantage of this service by paying £1.85 per extra mile. Mileage is calculated using the quickest route on Google Maps. This service is only applicable to the UK mainland. We charge a one-off small £20 booking fee. That’s it - nothing more and no add ons when you pay the balance. E&OE. ABTA P6710.